During the Willamette Music Festival, a young man shared his dislike of the Confederate flag. He made the remark when a black Ford pickup drove through the festival’s campground waving the flag passed him. 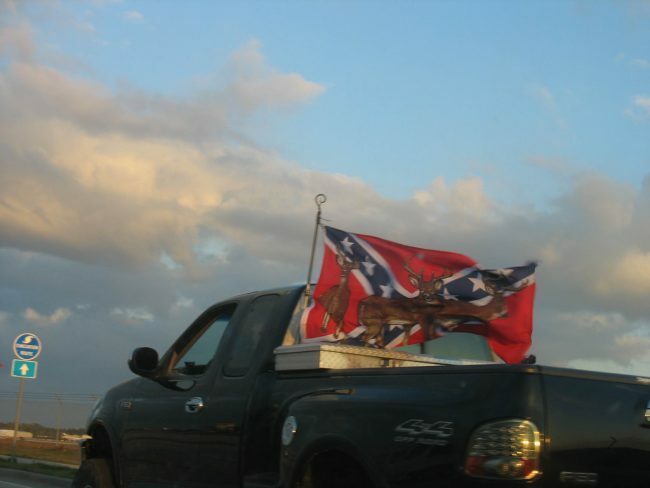 He yelled at the three white occupants of the vehicle telling them he did not like their flag. A verbal match started when one man jumped from the Ford to confront the 18-year-old black. Unfortunately, the young white man hit him several times, then took off in the truck. Officials from the Linn County Sheriff’s Office in Oregon, are looking for the suspect and the two others in the black Ford pickup. The specific description of the suspect; he is in his late teens, possibly early twenties. He is wearing jeans, a black tank top, brown boots, and a black cowboy hat. Linn County Lt. Michelle Duncan told the reporters they will not rule out a hate crime, but until that decision is made the charge will be assault. The victim was transported to the hospital for the treatment of non-life threatening injuries. His condition has not yet been released.